Military Cross; Awarded to commissioned officers or below for distinguished and meritorious services in battle. Air Force officers can be awarded the medal for gallant and distinguished services on the ground. Brooks was one of the five members of the R.C.A.F. awarded the Military Cross in World War II. (The Military Cross is essentially an Army award.) His M.C. citation was the longest of anyone in the Royal Canadian Air Force during WW2. Canadian Volunteer Service Medal with Clasp; Granted to persons of any rank in the military forces of Canada who voluntarily served on Active Service and have honourably completed eighteen months (540 days) total voluntary service from September 3, 1939 to March 1, 1947. A silver bar (often called a clasp), a maple leaf at its centre was awarded for 60 days service outside Canada. War Medal 1939–45 Mentioned-in-Dispatches; Minimum of 28 days service in World War II, "Mention in Dispatches" – The custom of naming in a commander's official report of a battle or campaign those military personnel who distinguished themselves by exceptional heroism, service, or achievement. The honor is considered a decoration and entitles the individual so mentioned to wear a small metallic device, usually a star, on the campaign ribbon for that battle or campaign. Canadian Centennial Medal (1967); Issued to commemorate the Centennial of Canada's Confederation in 1867, was awarded to people recommended by governments and associations. 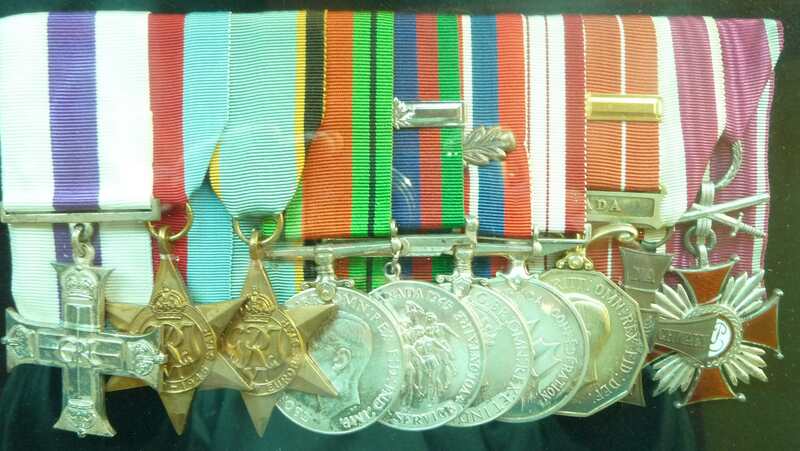 The Canadian Forces were awarded almost 30% of the medals issued. Canadian Forces Decoration with Clasp; Awarded to officers who have completed twelve years of service. A bar or clasp shall be awarded for every subsequent period of ten years of qualifying service.